Rihanna is a Barbadian singer, songwriter, and actress. She is one of the best selling music artists of all time, and has won multiple awards over the years, including Grammy awards, and many of her studio albums going platinum. As of 2019, Rihanna’s net worth is estimated to be $260 million, making her one of the richest singers in the world. Rihanna was born, Robyn Rihanna Fenty, on the 20th February, 1988, in Saint Michael, Barbados. Her mother is a retired accountant, and her father a warehouse supervisor. Rihanna has 5 siblings: two brothers, two half-sisters and a half-brother. Whilst she was growing up, her father had an addiction to crack cocaine and alcohol, and Rihanna had to see doctors and receive CT scans for the headaches she was experiencing at the time. These turned out to be mainly stress and trauma induced, as once her parents separated, her health started to improve. Rihanna began singing at the young age of just 7 years old. She didn’t graduate high school, and instead decided to focus all of her efforts on her music career. In 2003, Rihanna formed a musical trio with two fellow classmates. She was quickly discovered by an American record producer in Barbados, and he invited Rihanna to his home in the States to record some demo tracks. Within the same year, Rihanna was signed to Syndicated Rhythm Productions. Jay-Z heard some of the initial tracks that were sent to recording labels, and as the CEO of Def Jam Records, he was desperate to sign Rihanna to the label. In fact, Rihanna came in one day for a meeting, and the team at Def Jam made sure she didn’t leave the building before they managed to get a signed contract from her. Signing with Def Jam paved the way to Rihanna’s success you see today; including dozens of awards and multiple platinum awarded albums. In the past couple of years, she’s also begun to diversify into the area of acting, and has played roles in several films. View our larger collection of the best Rihanna quotes! Rihanna is one of the most successful singers in the world, and continues to diversify her career. In 2019, Rihanna’s net worth is estimated to be $260 million, making her one of the richest singers of all time. 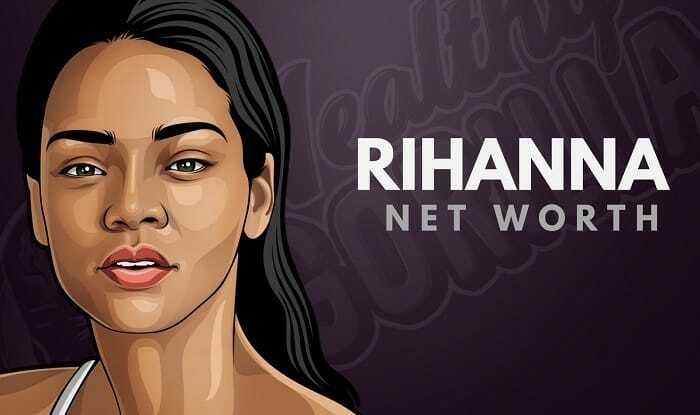 What do you think about Rihanna’s net worth? Leave a comment below.